Kasey turned 12 on February 11th. She requested a cake decorated in "her" colors - aqua blue, lime green, and purple. 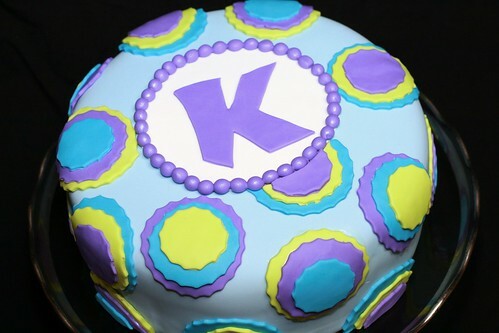 She wanted the concentric dots like I had done for her daddy's birthday cake last August. I baked three 9" layers of French Vanilla cake using the White Almond Sour Cream recipe. I separated the batter into two equal parts and tinted one aqua blue and one purple. Then I dropped alternating scoops of batter on top of each other. The result was a purple and blue striated cake when you sliced it. I used Bavarian cream filling between the layers. Frosted the cake with butter cream frosting and then covered it with fondant and then the fondant appliques. I finished it off with a large "K". I displayed the cake on a glass cake pedestal rimmed in silver. It's the same one that was used for our cakes when we were kids, so it holds a special meaning to me. 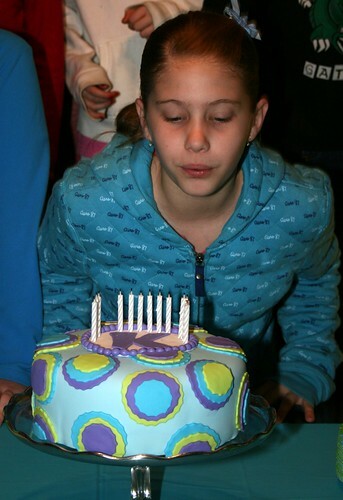 She loved her cake and her friends were amazed. Now they all want me to make their next birthday cake. Wow, your blog are so pretty and so insightful. That cake look so good!